WEST LAFAYETTE, Ind. — Purdue University is taking its pilot desk-side recycling program campus-wide in an effort to significantly boost recycling rates. The program, launched at Freehafer Hall in July, provides recycling bins at workers’ desks, but requires them to walk to a central location to deposit trash. Within four weeks worker participation reached 99.5 percent and recycling volume doubled. After tweaking the program based on feedback from Freehafer staffers, Physical Facilities introduced the program to the Civil Engineering Building in August. First-week staff participation topped 99 percent, and recycled volume increased more than 50 percent. Director of building services Terry Ashlock said the program will be expanded to five more buildings this week. Desk-side recycling will be implemented at six more buildings this semester, including three new buildings that come on line this fall: Discovery Learning Center and Hockmeyer and Niswonger halls. Beginning in January the program will be implemented in 10 buildings at a time until rollout is complete. 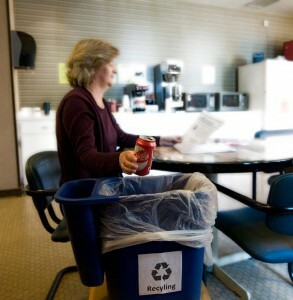 Desk-side recycling is a key component in Purdue’s comprehensive plan to boost the campus recycling rate to 65 percent by 2014. That plan will be presented to the public on Monday (Sept 21) as a kickoff to Purdue Green Week 2009. In the 2008-09 academic year, Purdue increased its overall recycling rate to 48 percent and reduced the amount of trash sent to the landfill by 500 tons. A consultant helped Physical Facilities implement or expand a number of tools. Collaboration with other university administrators and student leaders led to advancements including: roll-off recycling containers at residence halls, football game day recycling and sending tons of food waste to an anaerobic digester at the West Lafayette water treatment plant to create methane to power the plant. For the 2009-10 academic year, Physical Facilities has added 31 exterior recycling containers in high-volume pedestrian areas and purchased a high-powered industrial shredder that breaks plastic, wood and metal into sellable byproducts that no longer go to a landfill. The university also will install larger dumpsters for recyclables and smaller dumpsters for trash. Grounds director Gary Evans said that after 15 years of formal recycling, Purdue will focus on increasing the raw volume of recycling rather than asking people to separate their recylables into several categories. “We will maximize Purdue’s recycling rate by the most cost-effective and efficient means,” Evans said. Physical Facilities Building & Grounds has established a recycling assessment team that will continue to help document, analyze and publicize recycling efforts, and adapt and expand successful practices on an ongoing basis. That process for change has already implemented dual-stream recycling, which allows the separation of office paper from personal recyclables such as mixed paper, plastic, aluminum, Styrofoam and glass.